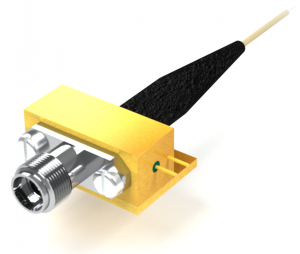 PQW10A-L is a long-wavelength, high speed microwave photodiode module designed for direct optical-to-electrical conversion of RF-modulated optical signals and provides a minimum bandwidth of 10 GHz. The optical input is supplied through a single-mode 9/125 um fiber pigtail. The RF output of the device is provided through a K-connector. The photodiode inside this module is a high performance Albis InGaAs p-i-n photodiode, designed to operate in the wavelength region from 1260 to 1620 nm.